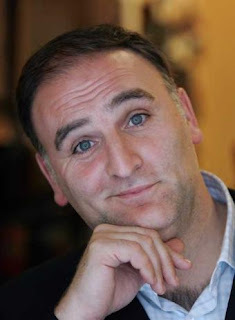 Jose Andres is possibly the best known and most accomplished Spanish chef in America. He introduced the US to the whole small plates thing in the '90s and has been at the forefront of introducing molecular/techno-emotional/modern/whatever cooking to America, too. He apprenticed under Ferran Adria in the late-'80s, he's a TV star in Spain, has an English-language show on PBS called Made in Spain and is a certified Friend of Bourdain. He also owns a restaurant called Oyamel in Washington DC that opened my eyes to how brilliant Mexican food can be. What a guy. The Bazaar in Los Angeles brings together the traditional and modern sides of Andres' cooking, with the menu split down the middle between traditional tapas and inventive small plates that are mostly in the key of Spanish. It's a massive restaurant, with a huge bar, two tapas sections (Rojo and Blanca) that serve the same menu with different decor, and a "patisserie" that serves dessert to restaurant customers and others wandering in. The restaurant has a fun, Alice in Wonderland atmosphere, although the indifference of some of our fellow diners astounded me. The table next to us was filed with two jaded early-40s power couples who had apparently been to the restaurant before, yet seemed not to care for the food. They played with their BlackBerries the whole time, and seemed to be disinterested in the food and each other. Why would you bother? Anyway, other than some questionable customers, the Bazaar is an incredible restaurant. I'm not usually a fan of long blog posts that walk you through a meal dish by dish, but... here's a long blog post that walks you through a meal dish by dish. Sorry about that. "Olives, modern and traditional" is a kind of thesis statement for the restaurant, uniting the "modern" and "traditional" halves of the tapas-based menu. The modern olive is Ferran Adria's spherified olive, pure olive liquid bound in itself with sodium alginate and calcium chloride like a raviolo without the pasta. If you've got a few olives and a stash of chemicals, you could make them at home! The modern "olives" are ladled from a jar and set next to a tin of more orthodox green olives, stuffed with orange zest, piquillo pepper and superlative anchovy. You're instructed to eat the traditional olive first to get a sense of the texture and then to try the modern version. The spherified olive must be one of the most famous and defining dishes of this decade. I thought I was prepared for them, but they still shocked me. They flood your mouth with olive juice with a bang, and it's so completely strange that it forces you to focus on the flavour of olive, something that you're so accustomed to that it usually wouldn't be remarked upon. That's what's great about these modern techniques, cliched though spherification has become. This isn't flashy manipulation for its own sake, it's just a modern technique used to draw attention to a fantastic ingredient. "Just a shrimp cocktail (yeah right)" is 3 large prawns, each skewered on a plastic syringe of sorts. You bite the prawn and squeeze the end of the skewer to fill your mouth with the shrimp cocktail "sauce", a spicy tomato water. Yes, it's actually called "Just a shrimp cocktail (yeah right)", but I can forgive that kind of tweeness when the result is this tasty and surprising. On the 'traditional tapas' side, "papas canarias" was a surprisingly humble revelation. It's a simple dish of potatoes served in the salt they were cooked in. They're roasted 'til wrinkled and served with a Mexican mojo verde as a dipping sauce. The tangy sauce is somewhat reminiscent of an Italian salsa verde, all acidic zing and herbs. The potatoes themselves were incredible, with a concentrated, almost sweet earthiness, and somehow the salt dusting and the acidic salsa completely balanced one another. We're planning to start growing some potatoes just so that we can try and recreate this incredible dish. One of the very best dishes we ate in the US, and so basic! We tried a few other traditional tapas, including rich, gelatinous braised beef cheeks and a rustic salad of egg, tuna belly, carrot and peas with pristine olive oil called "The Ultimate Spanish Tapa". They were fantastic, but it's the more inventive end of things that really sticks in the memory. "Philly cheesesteak" is a re-constructed ode to a low-brow American classic. Andres' version consists of wagyu carpaccio atop cruncy, hollow "air bread", filled with warm cheese foam. Delicious and fun, although the strong cheese slightly overshadowed the thin wagyu slices. If I'm paying for wagyu, I want to taste wagyu. This linguine isn't linguine at all. Instead, it's "miso linguine", made by pouring a shallow miso broth gelled with agar agar and then cutting the set jelly into ribbons. The strands of "linguine" melt in your mouth and reform the broth. It's served with smoke trout roe. This dish, cotton candy foie gras, plays off the tradition of serving foie gras with sweet accompaniments (or at least a sweet wine) to cut the fattiness. Here the cube of liver is seasoned and then wrapped in cotton candy that has been lightly accented with vanilla. I love the idea of presenting one of the ultimate fine dining ingredients in a way that is more reminiscent of a circus. I suppose that sums up the Bazaar, in a way. The important point is that almost all of these dishes are extremely satisfying. All the whimsy and fancy technique just enhances the experience, it isn't a crutch or a smokescreen to disguise substandard food. After our tapas feast, we moved through to the patisserie for dessert. It was a nice change of pace and a cunning strategy to turn tables faster for the restaurant. I'm fine with that when it's done this well. We wandered around looking at the cases of mignardises, the open pastry kitchen, the massive stacks of candles that look like macarons, the art and arty objects. All for sale, all a fun multicoloured jumble. Dessert itself was ever-so-slightly disappointing. My "nitro floating island" was flash frozen meringue atop caramelized bananas and vanilla. Very tasty and inventive, but featuring too much meringue perched on top of not enough sauce. A minor quibble with a great meal. The Bazaar is surprisingly cheap for those of us from Perth who are used to cowering in fear at the sight of a tapas menu. I think (from memory) we spent around $125 per head for food, and we ate a lot of food (as you can see) and took a few things home from the patisserie. A good start to our trip. Coming up: The French Laundry! An interesting read. A lot of the dishes looked like food from the future. I was happy to hear that the techniques they used served to focus attention on the flavour rather than technique for it's own sake. Great post. I admit I got a little apprehensive when I spied the spherified olive, but it really does seem like the fancy techniques just enhance the overall food experience, like you say. The joy of the papas canarias reminds me of Indiana Jones and the Last Crusade, when the real treasure was the dirty old chalice and not the shiny fancypants ones. I'm somewhat perplexed and a little ashamed as to why that immediately came to mind but I thought I'd share it. I wanted a photo of you in the restaurant! Oz: I have photos of S in the patisserie, but I think she might kill me if I post one! Conor: Thanks! I do love a bit of a fancy technique when it's done well. Haha Conor that analogy is great, and totally appropriate! It's clearly time for me to go back.. Saam room still has a $95/pp, 20 course tasting, but the "brunch" prix fixe seems to be a much better option.